Our equipment and staff is an integral part of our success. We have a fleet of over 10 sweepers. 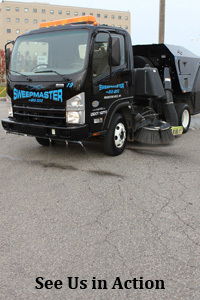 We use both Vacuum and Mechanical Sweepers purchased from the sweeping industry leaders of Schwarze Industries and Elgin Sweepers. We also compliment our fleet with dump trucks, loaders and pick-up trucks to perform any landscape, sweeping or snow removal job. There is no job too large or too small for Sweepmaster. Each property has a detailed plan of how and when it will be swept. We can custom tailor a scheduled program based on frequencies that best suit your property. You may never see us, but you will know we were there.